Red Lobster is putting a seafood spin on chicken and waffles. And yes, the dish is topped with maple syrup, too. Think chicken and waffles are the ultimate sweet and savory, deep-fried decadent delight? Get ready for Red Lobster's version. The seafood chain is taking the Southern classic under-the-sea with its latest offering for Lobsterfest: lobster and waffles. Dubious? Don't judge it, yet. First off, the chain isn't using a traditional buttermilk waffle as the base. These waffles are a spin on one of the lobster chain's most coveted items: their famous Cheddar Bay Biscuits. The biscuit mix is poured into a waffle maker and cooked until toasty, then topped with fried lobster tails and a drizzle of maple syrup. It's salty, it's crispy, it's sweet, it's savory. Lobster and waffles will debut at Red Lobster, which recently celebrated its 50th anniversary, on March 26. A Red Lobster spokesperson told TODAY Food that the new Lobsterfest menu item will only be available for a limited time at all locations but there's no specific end-date set for the dish's run. And the dish isn't cheap, either. It costs $20 ... but hey, you're getting breakfast and dinner! The dish clocks in at 1,080 calories so you can definitely stretch it out into two meals. 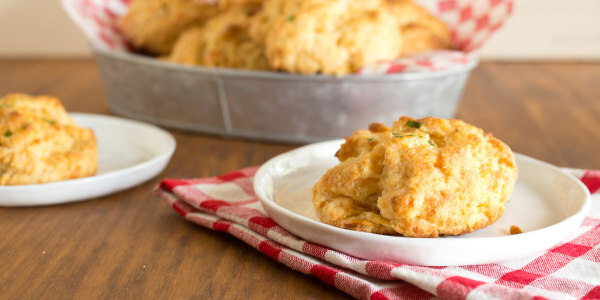 Love Red Lobster's Cheddar Bay Biscuits? Learn how to make them at home!